Dear Nagpur, this is what you drink! Crossing the bridge on river Wardha in November 2014 on the way to Wani from Ghuggus village in Chandrapur district of Maharashtra, I saw an unusual waterfall on the left side of the bridge. No source of water like stream or rivulet cannot be seen. 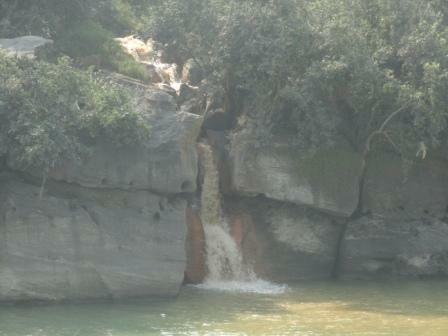 Looking at the waterfall, it struck me that the waterfall is having muddy water months after end of monsoon. As I got closer to the waterfall the stark reality unfolded. The colour of waterfall is almost red and there is layer of oil, grease settled on river water. An entire stretch of the river is coloured red. According to local activists the source of the water in the waterfall is the mine discharge of Ghuggus Opencast Coal (GOC) mine of Western Coalfileds Ltd (WCL). This coal mine is situated exactly on the left bank of river Wardha. Left image shows Mine discharge water of Ghuggus Open Cast (GOC) coal mine falling in River Wardha. 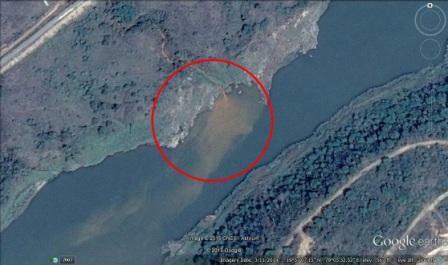 Right image shows oil and grease layer on river water where mine discharge of GOC meets Wardha. Photographs taken on 16th Nov 2014 by Author. 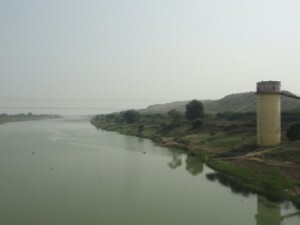 Not just this, but the entire stretch of Wardha River from Majri to Rajura village in Chandrapur district of Maharashtra is lined on the sides by overburden dumps of coal mines on both the banks. Overburden is the topsoil and rock which is above the coal deposits and is removed during surface mining to reach the coal. 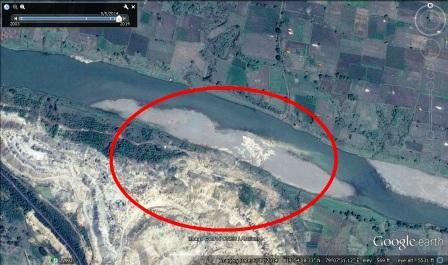 During my visit to this area I saw overburden dumps are on/near the banks of river Wardha. There is absence of retention walls, catch drain and green cover on overburden dumps which are near and almost on the banks of river Wardha. Silt and water coming out from these dumps is directly entering into the river. The same situation was seen during visit to River Iraie and Amala nala which are major tributaries on left bank of river. Red coloured mine discharge water from Navin Kunada, Juna Kunada Naigaon, Telwasa, Dhorwasa and Ghuggus open cast coal mines is directly/indirectly entering into Wardha River and polluting it. Field reports of the Maharashtra Pollution control Board show that mine discharge water coming out from Telwasa, Dhorwasa, Navin Kunanda and Juna Kunada open cast coal mine is acidic in nature showing pH value below 5. This indicates its highly acidic nature. Without proper handling and treatment when this acidic mine discharge water comes in contact with natural environment it increases solubility of metals from their composite forms. As a result the concentration of heavy metals in mine drainage is likely to be more and due to direct discharge of untreated acidic mine discharge water threat of water contamination in Wardha River is bound to increase. 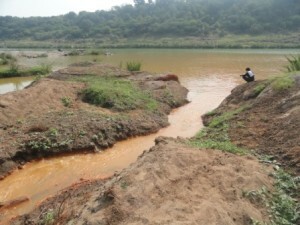 The area where acidic mine water is discharged in the river is upstream, of source of drinking water for towns like Bhadravati, Ghuggus and Ballarpur. There are also numerous villages on the banks of the river dependent on drinking and sanitation water supply from this river. 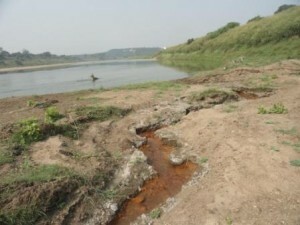 The acidic mine discharge water is threatening health of people living in surrounding areas who are dependent on river for their drinking water. 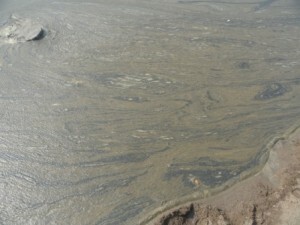 Mine Discharge water of Naigaon Open Cast coal mine meets directly to river Wardha (left photo). Image on right is Google earth image of same point. Photographs taken on 16th Nov 2014 by author. Left photo shows mine discharge water coming out from Telwasa open cast coal mine meeting river Wardha and right photo is of mine discharge water discharged from Majri Open cast mine without sedimentation process in local drain which meets Kondha nala and ultimately river Wardha. Photographs taken on 17th Nov 2014 by Author. On 3rd Feb 2015 the Maharashtra state government shocked people in the Vidharbha mines area and environmental activists by announcing the scrapping of its River Regulation Zoning (RRZ) policy. This policy was made in the year 2000 and was amended in year 2009. The main aim of this policy was to regulate siting of industries from High Flood Lines (HFL) of river according to their pollution category. As a result of this policy there were 7 coal mines around river Wardha which were not getting consent to operate from the Consent Appraisal Committee (CAC) of Maharashtra Pollution Control Board (MPCB). 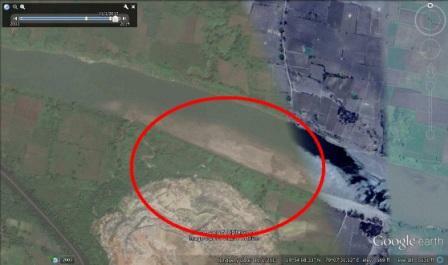 These coal mines were violating the norms of this policy as their locations were near or on the bank of river Wardha. After scrapping RRZ policy for now there is absence of any siting criteria for setting up any industrial units around rivers of Maharashtra. This decision of Maharashtra state government has made it more critical to tackle issue of water pollution in river Wardha. Google earth Images of year 2013 and 2014 shows that the overburden dump of Mungoli Open cast coal mine which was on the bank of river Wardha during year 2013 (left image) entered into Riverbed during year 2014 (right image). This has been verified during site visit by Manthan team. Further it says that GOC coal mine is not following the conditions and further action should be started by higher authorities. During visit to the area by Manthan, as shown in images earlier the mine discharge water was red in colour and there was oil and grease layer on water. As this report says that water is discharged outside from ETP, Manthan team suspects that the oil and grease layer on discharged water is due to non-functioning of ETP of GOC coal mine. As a result regional officer of MPCB wrote to CAC on 5th December 2014 asking it to take action against the mine. However till present there is absence of any action. Subsequently the CAC have approved consent to operate to GOC. 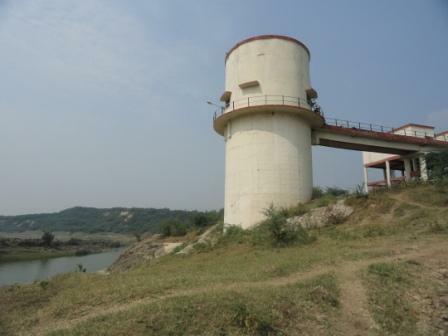 Left image intake well of drinking water supply to Mungoli coal mine colony which is downstream of mine discharge of Naigaon and Ghuggus opencast coal mines in river Wardha. Right image, of intake well of Bhadravati Town in river Wardha. Mine discharge of Majri, Navin Kundada and Juna Kunada coal mines meets river Wardha upstream of this intake well. On 27th March 2015 Smt Shobhatai Fadanavis, Member of Legislative Council brought an attention motion in the Maharashtra state assembly related to pollution issues of Chandrapur district of Vidharbha region. The motion said that there is an issue of water, air and land pollution due to industrial units and coal mines. Due to bad air quality people living in surrounding areas are suffering from respiratory illnesses. Times of India reported on 28th March 2015 that, in response to Smt Shobhatai Fadanavis’s motion the environment minister of the state had announced that four polluting industrial units namely Bilt Graphics Paper Products Ltd, Awantha Power and Infrastructure Ltd, Karnataka Emta Coal Mine and Wardha Power Company Ltd will be closed due to issues of pollution. At the same time he announced that the bank guarantee of 24 industries will be forfeited due to ongoing pollution. According to the local activist and reporters all the four projects are working and still polluting the environment without any state control. The state Environment Department and State Pollution Control board have failed to implement effective measures to control pollution and restore environment in and around critically polluted area of Chandrapur district. From political executive side there is lack of will to take strong action. As stated above the issue of pollution is raised and debated on different platforms. However there is absence of any action oriented results. The MPCB and CAC have active roles in controlling pollution, but these are diluted due to lack of resources and state support. Unfortunately, ground situation of pollution continues as it is, and people around river Wardha are forced to drink river water which is mixed with acid mine drain and overburden silt. MPCB (2013): Joint Visit Report 9th December 2013, Maharashtra state Pollution Control Board, regional office Chandrapur, Maharashtra, India. CPCB (2000): The Environment Protection Rules 1986 – Standards for coal mines, Central Pollution control Board, New Delhi, India. Web link – http://www.cpcb.nic.in/Industry-Specific-Standards/Effluent/494-1.pdf accessed on 24th July 2015. MPCB (2015): Circular related to cancellation of RRZ policy of 2009, Maharashtra Pollution Control Board, Mumbai, Maharashtra. Maharashtra Government (2009): River Regulation Zoning Policy of 2009, Environment Department, Government of Maharashtra, Mumbai, India. Web Link – http://www.mpcb.gov.in/consentmgt/pdf/GR_RiversWQ2009.pdf accessed on 23rd July 2015. Maharashtra Government (2015): Minutes of state assembly held on 27th March 2015, Maharashtra State Assembly, Government of Maharashtra, India. Web Link – http://mls.org.in/OrderOfDayC_budget15.aspx accessed on 1st April 2015. TOI (2015): 7 WCL mines to benefit from scrapping of RRZ policy, Times of India 29th March 2015, Mumbai, India. Web link – http://timesofindia.indiatimes.com/city/nagpur/7-WCL-mines-to-benefit-from-scrapping-of-RRZ-policy/articleshow/46729681.cms accessed on 17th April 2015. MPCB (2015): Minutes of 1st Consent Appraisal Committee meeting of 2015-2016 held on 15.04.2015, Maharashtra State Pollution Control Board, Mumbai, India. Web Link – http://mpcb.gov.in/consentappraisal/pdf/1st_CAC_1542015.pdf accessed on 17th April 2015. NGT (2014): Shri Vinesh Madanaya Kalwal Vs State of Maharashtra and others, Judgment , National Green Tribunal (Western Zone) Bench Pune, India. Web Link – http://www.greentribunal.gov.in/Writereaddata/Downloads/30_2013(App)(WZ)_16May2014_final_order.pdf accessed on 17th March 2015. MPCB (2015): Joint Visit Report 1 December 2014, Maharashtra state Pollution Control Board, regional office Chandrapur, Maharashtra, India. According to environment clearance of coal mines, all overburden dumps should have retention wall with weep holes, catch drains and should be stabilized by green cover. 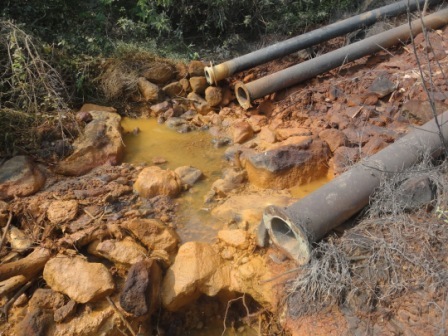 The mining authority should submit status of such compliance in every six months of mining operations to the Ministry of Environment Forest and Climate Change. Manthan had visited coal mines area around river Wardha on 13th Nov 2013. 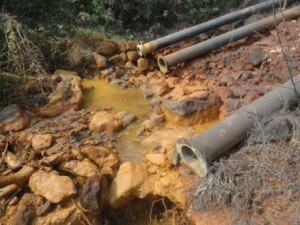 During this visit issue of water pollution due to mine discharge had came in focus. As a result of this local reporters reported related news in news paper on 8th December 2013. As a result of this regional officer of MPCB visited the area on 9th December 2013 and made a joint visit report, which clearly indicate violations of consent to operate conditions and validate all issues raised by Manthan’s field visit findings. According the joint visit report of MPCB regional office to WCL Majri area on 9th December 2013 there is discharge of mine water having pH2 to 3 into River Wardha directly/through Kondha nala from Dhorwasa, Telwasa, Navin Kunada and Juna Kunada Open cast coal mines. According to Central Pollution Control Board’s standards for coal mines under Environment Protection Rules, 1986, the pH of mine water discharge into natural environment should be between 5.5 to 9.0. Mine discharge water of Naigaon Open Cast coal is pumped through deep bore wells situated on the bank of the coal mine. According to a site official these bore wells are made to pump out water from abandoned underground coal mine,which in turn drain the water accumulated in Naigaon and Ghuggus Open Cast coal mines. According to RRZ policy 2009, for A-II class rivers, half kilometre distance from High Flood Line (HFL) should be no development zone, between the half kilometre to 1 kilometre zone, green category industries will be allowed, in the 1 to 2 kilometre zone orange category industries will be allowed and red category industries will be allowed beyond 2 kilometres on either side of river. Coal mines comes under red category industry. As per MPCB website entire stretch of Wardha River from boundary of Madhya Pradesh to confluence with Wainganga River comes under A-II class of rivers. According to the Minutes of 12th Meeting of Consent Appraisal Committee of MPCB, meeting held on 23rd April 2013, the consent to establish for Naigaon Opencast Mine, Bellora-Naigaon Deep Open Cast Expansion Project was rejected due to violation of RRZ policy. According to news article published in Times of India on 29th March 2015, Consent Appraisal Committee (CAC) of MPCB has rejected consent to operate/establish of Mungoli, Dhorwasa, Telwasa, Ukni, Telwasa Yekona-I and Yekona-II open cast coal mine of Western Coalfields Ltd (WCL)due to non-compliance with RRZ policy. The news article further says that these coal mines will be benefited from scrapping of RRZ policy by getting consent to operate/establish.